Willie stands alone by the side of the road. He is in the desert, a long way from home, and the heat of day is burning his skin. He can't stop thinking about the past, but he's making a mistake. He should be planning his next move. A few weeks later, standing quietly on the deck of a freighter, Will is alone again. Feeling like a prisoner on the open sea, he shakes his head. He is having a hard time believing he is the one responsible for the choices that have brought him here. And he is feeling guilty. Since leaving home, he has neglected his family and now he misses them dearly. Will is finally ready to head home, but he has one more place to go before he does. On a bus heading north, he is questioning himself again. How will he find who he is looking for? Did he even have the right to go? He has no way of knowing, but he's not yet ready to say goodbye to his old friend. Will finally settles his mind when he concludes that his search shouldn't take more than a few hours, a day at the most. But that night, in a stranger's house, everything changes when he meets Diana. 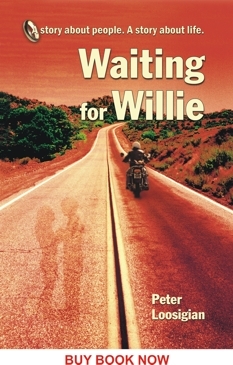 Click here to read excerpts from Waiting for Willie.